Everil Bell was hoping to open a bookstore on Larchmont when she first decided to go into business. She discovered Larchmont when visiting a classmate from Bishop Conaty High School who lived on Irving Blvd. AFTER 40 YEARS on Larchmont, Everil Bell is retiring. 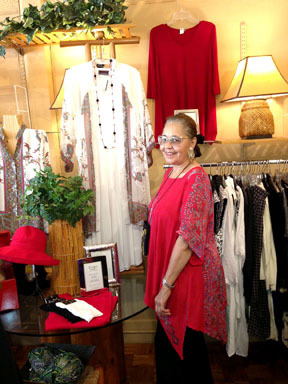 Once Everil leased the space, she opted to open a dress shop instead. My Favorite Place, is celebrating its 40th anniversary this year. And this will be her last month on the boulevard. Everil will be having a sale until she closes the shop on Sept. 30. She brought a unique style to Larchmont, offering unconstructed yet fluid clothing in her boutique. She has moved the store three times, once adding a stairway to a second floor. The ground floor store, called Odds and Ends, sold antiques and the top floor featured clothing. Today the store offers jewelry, purses, scarves and hats as well as an eclectic assortment of separates. She tried offering plus sizes for women in a second store called “All That and More,” but women didn’t like to shop in a store catering only to overweight women. Almost a Los Angeles native, she was four when her family moved here from Richmond, Ind. She is family-oriented, and was thrilled to find cousins she didn’t know existed while researching on Ancestry.com..
“Historic research and gardening are my two favorite hobbies,” she explains. Traveling figures in as well, and she has been to Bali 24 times where she buys inventory and is inspired to do her own designs. A mother of two sons and a daughter, and a grandmother to one, Everil is happy to be retiring. “After all,” she laughs, “it’s been 40 years.” Although she will miss the many friends she has made, she plans to keep busy with quarterly fashion shows, perhaps even leading buying trips to Bali.